Lowdown: Looking for someone to play with them, our toys end up at a childcare that's more like a POW. It’s been more than ten years since the last Toy Story instalment, but although the idea of a second sequel after so many years may raise stale connotations, Toy Story 3 feels as fresh as it did back in 1995. While it is a sequel to a sequel it still broke new grounds for us: let the history books show that Toy Story 3 was the first all-family movie night at home for us – the first time ever we sat down and watched us a film we’ve never seen before together with our three year old from start to finish. May we do it thousands of times more! The point is that Toy Story 3 is a film suitable enough to that purpose, which is not as trivial an affair as it sounds: keeping a three year old’s attention span for more than an hour and a half while not scaring him too much and not introducing him to things we do not want him introduced to yet (e.g., violence) demands pickiness in choosing your material. Add the need to entertain us adults in the process – we haven’t sat down to watch Toy Story 3 for the sake of our son, you know – and you realize the might of the challenge. I do have to say I am envious of my son. He’s getting his exposure to the fascinating world of film through Blu-rays projected on a big TV with surround sound far eclipsing CD sound quality; when I was his age all I had was a black & white TV with one channel broadcasting a few hours a day (mostly past my bed time). Maybe, eventually, he’ll realize how lucky he is. Alright, let’s talk a bit about the movie. Time did not fair well on Andy’s toys: as he grew up a lot of the toys were given away, and those that remained are not played with anymore. Still, the basic gang - Woody, Buzz, pig and dinosaur - are still there. As we join the foray their owner is about to leave for college tomorrow and has to quickly decide what to do with his toys; as per the series’ standard affairs, misunderstanding occurs and our toys find themselves donated to a childcare facility. At first it seems like they reached a toys’ heaven, a place where they’re always loved by an endless supply of children. They quickly realize there’s more to their new home than meets the eye: the facility is managed by an evil toy (whom I picked on early on because of its similarity with the baddie from Toy Story 2) running a Stalag 17 POW like camp with those in power abusing the weaker and the newer toys (in a manner not unlike Blindness’). Can our toys perform The Great Escape and return to their rightful owner? As already hinted, Toy Story 3 borrows a lot of themes from other films, notably World War 2 ones. Perhaps this make the film sound unoriginal, but that is not the case: for a start, it is obvious these elements are borrowed with a wink towards the adult viewer, the way most child+adult friendly animation films have been acting for years now. 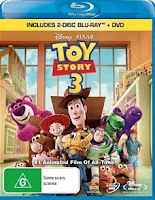 Second, Toy Story 3 uses these themes to support its own main themes – the ones we know about from its predecessors, mainly of the need for a toy to be loved and the value of friendship. There are some moments that stretch things out as far as the schmaltz factor is concerned, but the package feels very complete overall. It is clear some people have had fun making this film, and as per usual Pixar standards Toy Story is high octane fun without a glitch. There is a scene towards the end of the movie when all of our favorite toys are facing certain and imminent death at a furnace and there is absolutely nothing they can do about it. The certainty of the matter, coupled with its hopelessness, reminded me of the famous shower scene from Schindler’s List, thus contributing to my impression Toy Story 3 borrows a lot from famous World War 2 themes. The beauty of this scene is in what the toys choose to do at their hour of death: they hold hands in solidarity, celebrating them being together. Like many of the other Toy Story themes this is also something we can relate to: our [eventual] deaths are certain, and the dearest things to us all are those we love the most; we should therefore make the most of this connection we have with them during our limited time on this earth. Not the most child friendly scene ever, but a powerful and worthy one still. As has always been the case with Pixar films, the picture on this Blu-ray is state of the art quality (unlike the cinema presentation, though, this Blu-ray is 2D only). As I’m used to animation flicks having excellent picture quality my senses focused more on the sound department, where this Blu-ray offers a 7.1 soundtrack. Not that I can tell the difference (I don’t have that many speakers), but those that do should give Toy Story 3 a chance because while it’s not the most aggressive of soundtracks out there it does do a great job at the envelopment department – probably one of the best "you're right there in the middle of it" jobs I have ever had the pleasure of being involved at. Overall: Mildly tacky, Toy Story 3 is still a worthy 4 out of 5 stars contender.